Friday March 17 1911 Will and I went to town together at 1.15. I went over home & Will came for dinner after going over to see Mary awhile. I stayed with Mother till after 5 oclock. Hattie & Cora were both away. I began my second pillow case. Mother is having quite a time with a sore toe. Saturday March 18 1911 I was at home all day and busy sewing when not doing the cooking. Will to town in afternoon. A nice day. 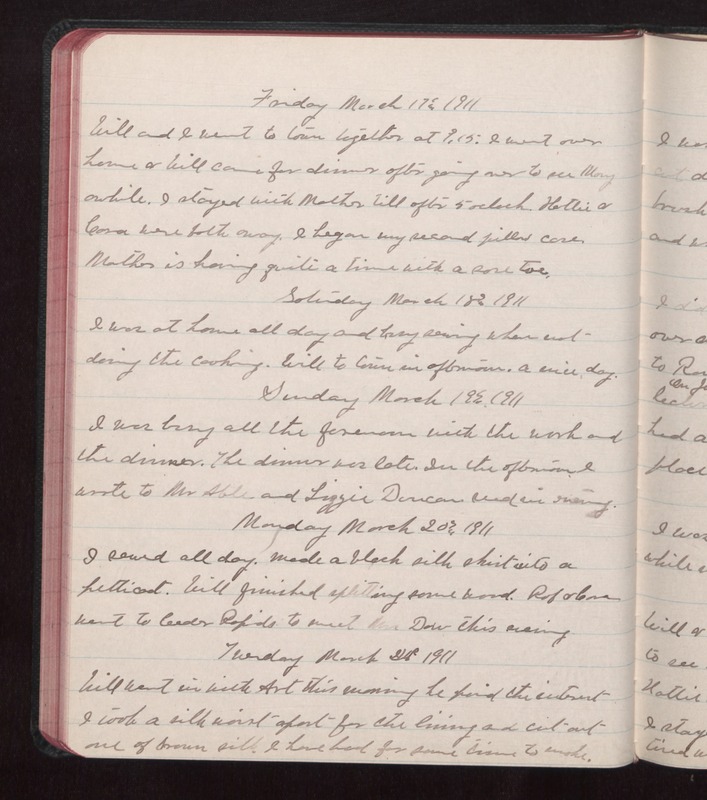 Sunday March 19 1911 I was busy all the forenoon with the work and the dinner. The dinner was late. In the afternoon I wrote to Mr Able and Lizzie Duncan read in evening. Monday March 20 1911 I sewed all day. Made a black silk skirt into a petticoat. Will finished splitting some wood. Rob & Cora went to Cedar Rapids to meet Mrs Dow this evening Tuesday March 21 1911 Will went in with Art this morning he paid the interest I took a silk waist apart for the lining and cut out one of brown silk I have had for some time to make.